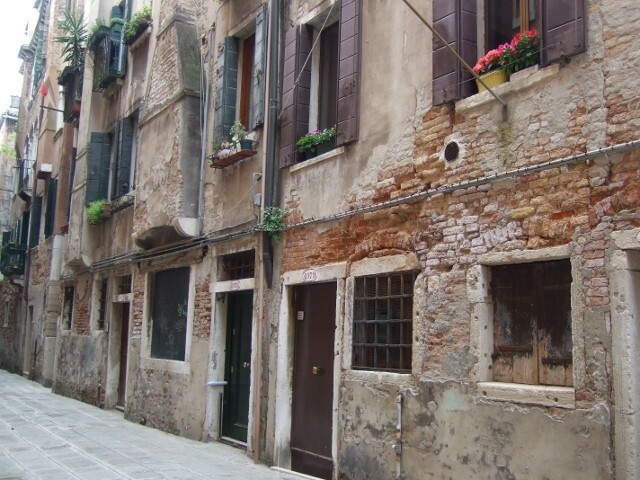 One of my favorite neighborhoods in Venice is the Dorsoduro sestiere, a quiet section where locals walk their dogs and push their babies in strollers. Venice is divided into six sestieri, and Dorsoduro is situated in the southern part of Venice, between the Grand Canal and the Canale of Giudecca, not far from San Marco. You could say Dorsoduro is in the "fins of the fish." 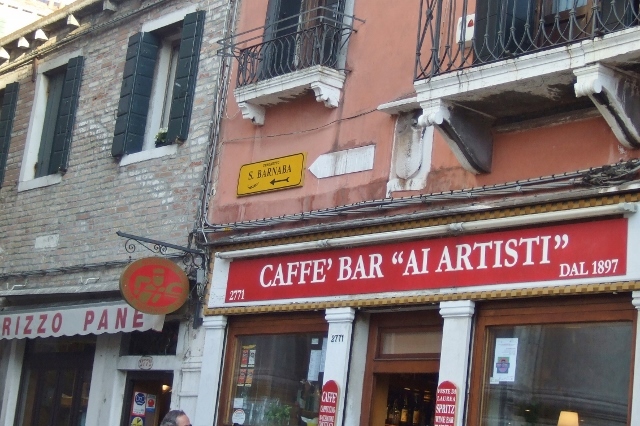 I stayed here on my last visit to Venice, and loved walking around the neighborhood, getting lost in the calli and speaking in Italian to the locals who live here. 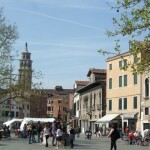 This popular piazza, with its newsstands, bars, and restaurants is a favorite of artists and writers. It has been the filming location for several movies, the most famous of which is the 1955 film, Summertime starring Katharine Hepburn. 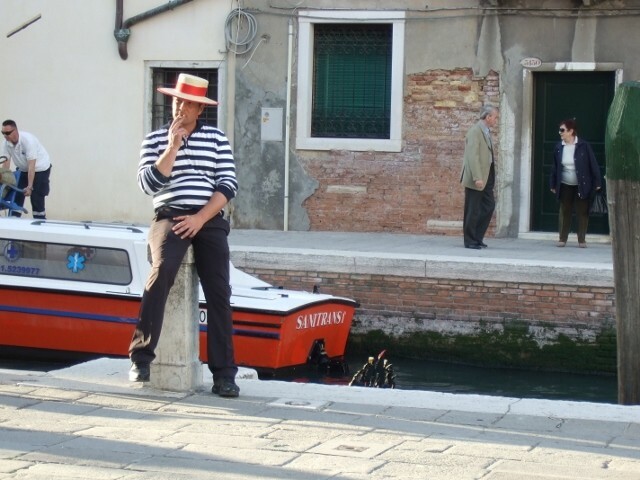 The Italian Job, Casino Royale, and Indiana Jones and the Last Crusade, shot some scenes at Campo San Barnaba. The Chiesa di San Barnaba which dominates the piazza is now a museum. My memories of sipping a cappuccino and people-watching still bring a smile to my face. Bar Ai Artisti is a great place for a late-night spritz. 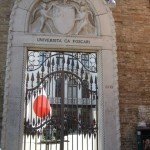 This large piazza is the hub of the college scene with the nearby Università Ca' Foscari, which has an enrollment of 20,000 students. 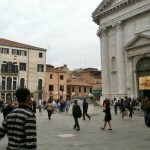 Plenty of gelato shops, wine shops, cafés, and night spots attract the young and the old to this large piazza. 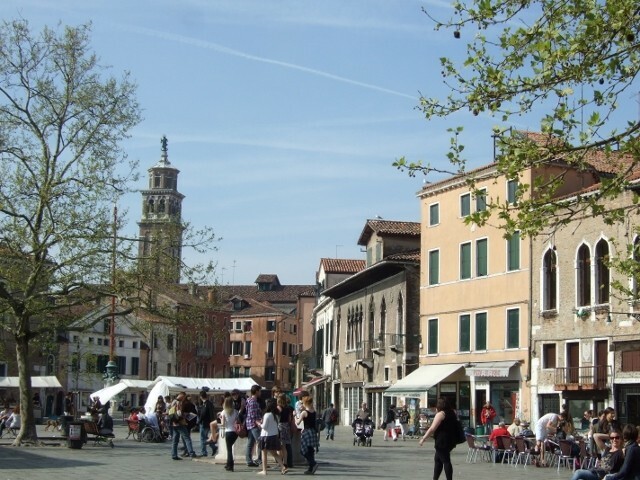 Popular with artists and students, Campo Santa Margherita is the place to be in the evenings, where places stay open till 2AM for a spritz, (prosecco with Campari), or a glass of vino. 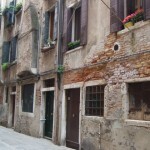 It has gained a reputation for a lively night scene, especially since the rest of Venice closes up early. 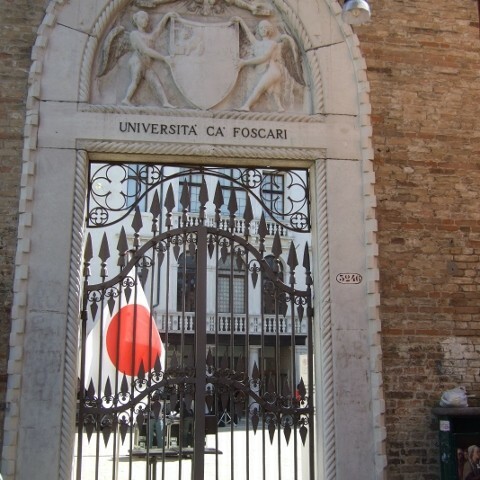 Two of Venice's art museums, The Accademia Museum and the Peggy Guggenheim Museum, are both located in Dorsoduro. Located directly on the Grand Canal, the Peggy Guggenheim Collection, as the museum is called, is especially popular with art aficionados who appreciate modern art. 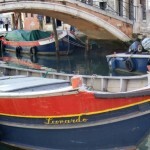 It is now one of the top tourist attractions in Venice. While not actually in Dorsoduro, this historic opera house is close by in Castello. It was previously destroyed several times by fires, rebuilt, and opened in 2003. With a seating capacity of 1000, La Fenice presents world-renowned opera, and also offers daily tours. Open daily from 9:30 to 6, Teatro La Fenice offers 45-minute tours, and tickets are priced at € 8,50 for adults and € 6,00 for student and seniors over 65. A little-known place that is not only fascinating, but also makes a great photo op, is Squero di San Trovaso. This gondola boatyard dates back to the 17th century, and today is mostly a repair facility for gondolas. 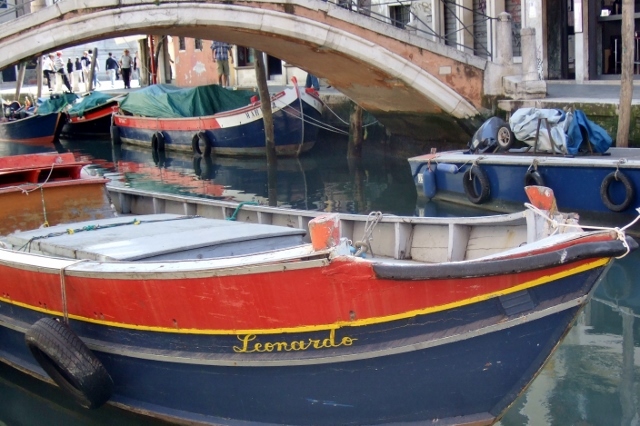 Located next to the Church of San Trovaso on the Rio San Trovaso, this boatyard is not far from the Accademia Bridge, and the friendly gondoliers have become accustomed to people watching them work. I wish I had known about this place, since I stayed just around the block. Next time. See, there is always a reason to return to Venice. 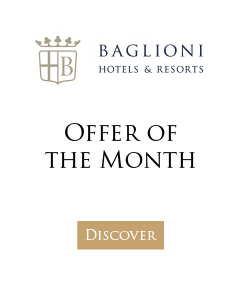 For those looking for a classy place to stay, the 5 star Luna Hotel Baglioni Venice is just a stone’s throw from Piazza San Marco and near most of the city’s main attractions. Margie Miklas is an American writer with a passion for Italy. She writes the blog, margieinitaly. Follow her on Twitter and FaceBook. 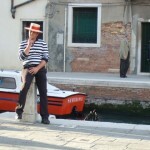 She is the author of Memoirs of a Solo Traveler – My Love Affair with Italy. 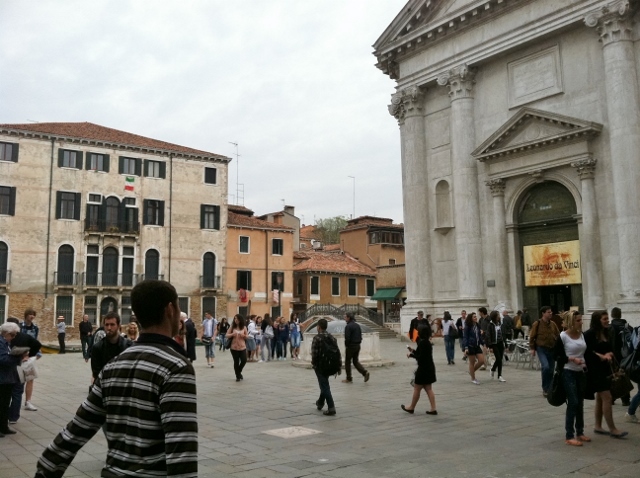 Most tourists to Venice make plans to see the main sights. However, there’s a whole other city to explore a few streets beyond. 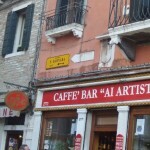 Dining in Venice can be expensive, but here are some insider tips for the best places to eat in Venice.